Calls to extend the Tube to a deprived area of north London have won the backing of the mayor. Ken Livingstone visited north Tottenham on Wednesday to see if the Victoria Line could be extended from Seven Sisters to Northumberland Park. Politicians, including MP David Lammy and London Assembly representative Jennette Arnold, say the area is cut off and the extension would help its regeneration. Extending the Tube could be relatively cheap, as there is already a track to a goods yard near the overland station at Northumberland Park. They also want transport links improved around Tottenham Hotspur's football ground to help keep the club in the borough. It wants to expand to seat 50,000 fans at White Hart Lane and there are fears it will relocate if transport links are not improved. Mr Livingstone's planners will look at how a Tube extension might work in the summer. Tottenham is one of London's most deprived areas, where 75% of families claim benefit. IKEA is planning to build a store there and other businesses are being courted as part of an attempt to regenerate the area. 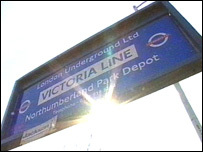 MP David Lammy told BBC London: "The important thing is to deliver an extension on the Victoria Line sometime soon - people desperately need it in what is a deprived part of London." "Trains are already shunted up to north Tottenham to a depot"